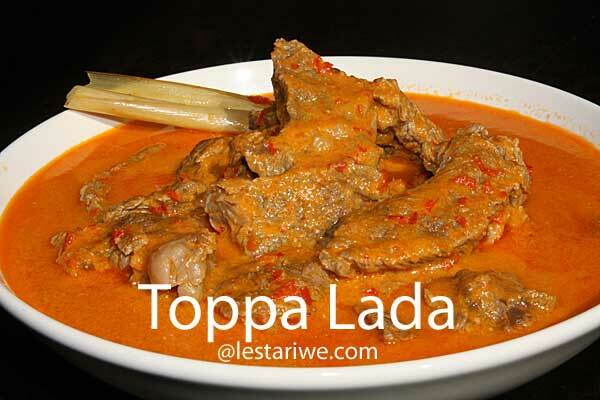 Toppa Lada is a traditional dish which originated from South of Sulawesi Province. Lada means Chilli, refers to large red chillies which are used in this recipe. In my opinion, the making of Toppa Lada is similar to Rendang, the famous dish which originated from the Minangkabau ethnic group in West Sumatra. 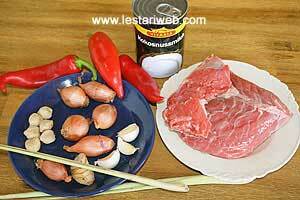 Only the spice is a little bit difterent and the cooking process is not as long as for making Rendang. The cooking process changes from boiling to thickening as the liquid evaporates. The slow cooking process allows the meat to absorb all the spices and to become tender. So for those of you who try this recipe for the first time, do not be surprised if in the beginning you can not obtain the taste as you wish. I suggest you to wait a little longer to adjust the seasoning, about 1 hour when the spice is completely absord by the meat and the coconut milk becomes thicken & tasty. This is the time to get the reward of your patience. Good luck OK?!! .. Put all ingredients for the paste in a blender or food processor. If necessary, add 50 ml coconut milk to help the blending process and blend untill smooth. Put the spice paste into a Wok or a large saucepan. Pour in the coconut milk, add the lemon grass & galangale. Stir to mix. Cook on medium heat untill the coconut milk get boiled. Stirring constantly. Add the beef. Continue cooking on medium medium and simmer for 1 hour until the coconut milk becomes thicker. Stirring occationally. Add tamarind juice & stir to mix. Adjust the seasoning, add salt and sugar if needed. Ensure that beef is tender enough before you stop cooking. Serve hot with rice.